A low price for a brand-new BlackBerry, and is significantly lower than the $129.99 that the carrier charged for the BlackBerry Curve 8520 at launch. 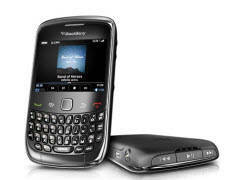 The BlackBerry Curve 3G is produced from T-Mobile as of September 8 for $79.99 (sign a new two-year service agreement). The Curve 3G is an updated version of the 8520 and packs in more features, so it's nice to see it launch at a lower price. The BlackBerry Curve 3G looks a whole lot like the 8520; it features the traditional BlackBerry design with a smallish 2.4-inch display at the top, and a full QWERTY keyboard beneath it. The Curve 3G's screen is one of the biggest drawbacks to the phone. It measures just 2.4 inches diagonally, which feels small compared to the displays on today's best phones. And its resolution is only 320 by 240, which is not as sharp as the high-resolution displays found on other BlackBerry phones, even older models like the Tour and Bold. I could handle the small screen if only the text and images it displayed looked better; as it is, the low resolution and small size of the screen combine for an underwhelming experience. The BlackBerry Curve 3G offers a decent mix of features for a low price, especially if you don't mind its small, low-res screen. The addition of 3G and GPS support makes this budget-friendly smartphone an attractive alternative to higher-priced models. And once it gets upgraded to the latest BlackBerry OS, the Curve 3G will shine.